Amerock, a respected leader in decorative hardware design, announces new product for 2017 that focuses on emerging trends in home décor. Amerock inspires with new design trends for kitchen and bath cabinet hardware. Amerock, a respected leader in decorative hardware design, announces new product for 2017 that focuses on emerging trends in home décor. Perfectly in tune with the desires of a design-conscious public, Amerock created a buzz at the January Kitchen and Bath Industry Show in Orlando, Florida, by unveiling additions to the successful 1929 Refined Collection, a line of products that are highly reflective of modern lifestyles but with distinct roots in the past. Sophisticated angular and faceted shapes are showing up in all elements of contemporary home décor. Amerock’s St. Vincent Collection is reflective of this style, combining crisp lines, faceted metallic edges, and soft curves. The naturally geometric shape of the t-shaped knobs and pulls catches the light beautifully with a nod to the dramatic. Engaging finishes across several sizes deliver function and sophistication kitchen renovation. Easy to accessorize and even easier to love, St. Vincent is as intriguing as it is distinct. There is a retro-revolution in kitchen renovation, and the charm of a farmhouse gets an exciting update when a touch of sparkle graces design features such as reflective crystal and polished cabinet hardware. 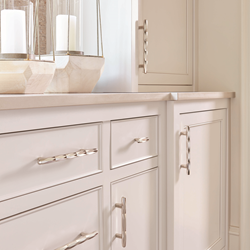 The gentle slopes of the Ashby Collection's cup pulls are a compelling canvas for a variety of finishes, like Polished Nickel, Golden Champagne, and Gunmetal. 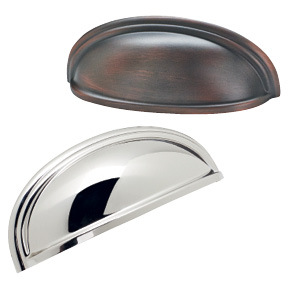 These cup pulls pair well with other hardware collections, such as Candler and Mulholland™, extending the design options. An innovative sculpted edge on the underside provides a comfort fingertip grip that is easier to grasp. For retrofits, every Ashby cup pull supports both 3-inch and 4-inch installations. White marble beckons from a Parisian café. The glimmer of brass swings through doors of a grand hotel. Black lacquer signals something magical is about to begin. To give your home the wonder of a luxury destination, pair chic white and black with the polish and punch of gold accents. Use Amerock’s Golden Champagne, Gilded Bronze, Black Bronze and Gunmetal finished hardware to celebrate this fashion statement. Look for these finishes throughout our portfolio and in our newest collections Oberon, St Vincent, Sea Grass, and Esquire. A growing appetite for minimalist design, smooth glass, and honed crystal is quickly moving beyond industrial-chic chandeliers to become the materials of choice in home furnishings. The Glacio Collection uses these same elements, blending crystal-clear accents and beautifully-finished mountings in a handful of stunning shapes. Glacio’s dual-layer style seems to float above the surface of drawers and doors, and instantly adds dimension to bath and kitchen cabinets, as well as custom furniture pieces. 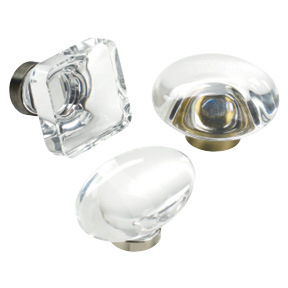 These shimmering round, square and oval knobs pair well with other hardware styles, such as bar pulls, Monument, and Cyprus™. Along with new collections, Amerock is extending their fashion-forward finishes, such as Polished Nickel and Gunmetal, across their product line. These new tones are specially created to match trending finishes in major plumbing and appliance brands, making cabinet hardware an easy extension of a design statement. An exciting addition is Bar Pulls in Golden Champagne, which complements faucets and fixtures now available in brushed gold. For a complete look at what's new from Amerock for kitchen and bath design, and for hardware throughout the home, visit amerock.com. You can also view the new hardware collections both online and in stores throughout the United States and Canada. Amerock’s award-winning decorative and functional hardware solutions have built the company’s reputation for chic design accessories that inspire designers and homeowners to express their personal style. Available in a variety of finishes and styles, Amerock offers high-quality designs at affordable prices. Founded in 1929, Amerock is headquartered in Mooresville, NC.